How does color affect embroidery? How can it bring needlework to life? Crafters will uncover the possibilities in this unique, in-depth exploration of color in embroidery. From color selection and blending to choosing complimentary colors and creative contrasting and shading, it highlights a variety of techniques for surface and counted thread embroidery projects. More than 200 stitched examples with DMC thread keys, plus color schemes and projects such as roses, fruits, and birds will inspire stitchers. 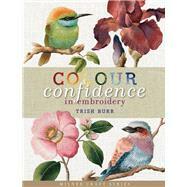 Trish Burr is the author of the highly successful Redoute's Finest Flowers in Embroidery (2002), Long and Short Stitch Embroidery: A Collection of Flowers (2006), Crewel & Surface Embroidery-Inspirational Floral Designs (2008), Needle Painting Embroidery-Fresh Ideas for Beginners, and The Long & the Short of it-A Needle Painting Workshop (DVD), all published by Sally Milner Publishing.